A cookbook by Kristen Miglore. Drawing from her James Beard Award-nominated Genius Recipes column and powered by the cooking wisdom and generosity of the Food52 community, creative director Kristen Miglore set out to unearth the most game-changing dessert recipes from beloved cookbook authors, chefs and bakers — and collect them all in one indispensable guide. This led her to iconic desserts spanning the last century: Maida Heatter's East 62nd Street Lemon Cake, François Payard's Flourless Chocolate-Walnut Cookies and Nancy Silverton's Butterscotch Budino. 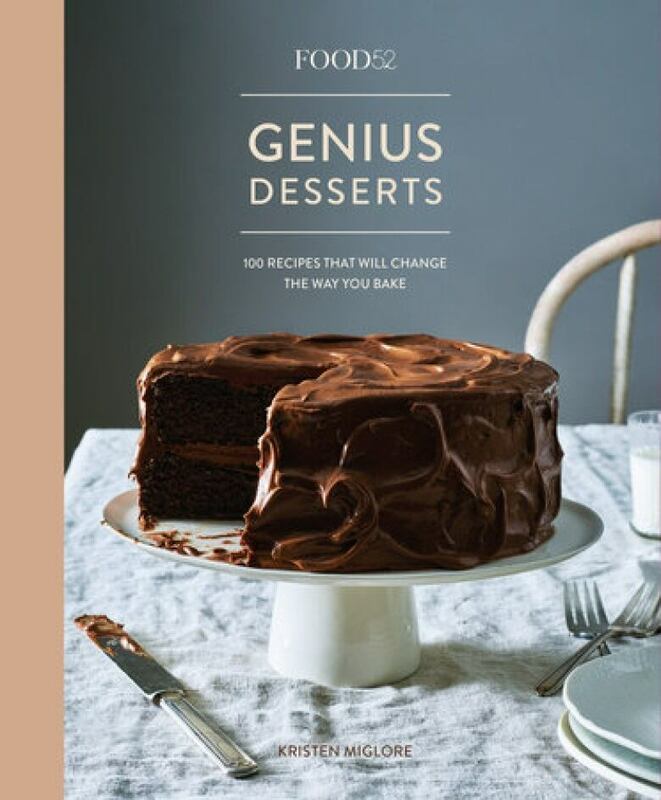 But it also turned up little-known gems: a comforting Peach Cobbler with Hot Sugar Crust from Renee Erickson and an imaginative Parsnip Cake with Blood Orange Buttercream from Lucky Peach, along with genius tips, riffs and mini-recipes, and the lively stories behind each one. Genius Desserts teach us to throw our old assumptions out the window. To wit: the most important tool for making Marcella Hazan's brittle, bittersweet Italian candy Croccante (page 79) is not a candy thermometer (you won't need one) but a potato. The best chocolate sauces have no dairy in them. In fact, there are two different, equally compelling recipes in this book, and you can make them both for a (suddenly very fun) ice cream party in all of 10 minutes (page 182). You will be shocked and maybe even a little disturbed by what makes the most otherworldly banana cake (page 98). You can make a piecrust out of saltine crackers with your bare hands (page 199) and it will go even better with a sweet-tart lemony filling than the more predictable graham cracker route would. Not to mention there's a whipped cream frosting that holds up for a week in the refrigerator (how?!) with no suspicious ingredients (page 124). These shockers and more await. From Food52 Genius Desserts by Kristen Miglore ©2018. Published by Ten Speed Press.